Brian Williams, Lester Holt and NBC News are locked in a lose-lose-lose scenario. Williams, the longtime anchor of the "NBC Nightly News," has been on the bench for nearly three months, suspended amid a scandal over exaggerations about an Iraq War mission. He has grown increasingly frustrated by the situation, according to sources near to the situation. He wants his position back and, more to the point, wants NBC to telegraph that he's coming back. "He's getting fed up," one supporter of Williams said on condition of anonymity. But Williams is not allowed to air his unhappiness -- NBC has prohibited him from speaking publicly. Meantime, NBC is also staying silent about its plans for Williams or its vaunted nightly newscast. And there's Lester Holt. 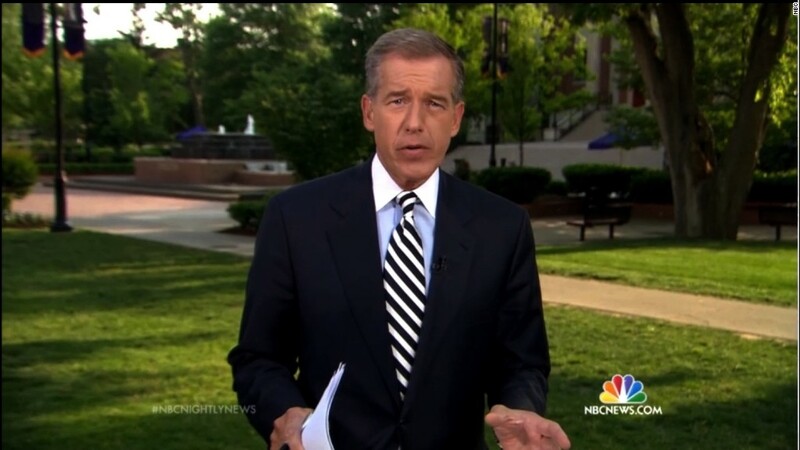 The fill-in anchor has steadied the ship and retained most of Williams' nightly audience. But some viewers have defected, enough that "Nightly News" has slipped into second place behind ABC's "World News Tonight with David Muir." The latest Nielsen ratings, released Tuesday, confirm that ABC has won among total viewers for three straight weeks. Now industry observers are starting to conclude that the audience shift is real, not just a blip. NBC did manage to beat ABC among 25- to 54-year-olds last week, by a mere 7,000 viewers. That only underscores how competitive the race remains and how much is at stake -- for Williams, NBC and Holt. All three parties are haunted by the uncertainty of it all. The network hasn't said whether Williams will be reinstated, creating ripe conditions for rumor, speculation and debate about what should be done. On Monday Fox News CEO Roger Ailes weighed in via an interview with The Hollywood Reporter. "I'd put Brian back, but I'd do it the right way," Ailes said, without elaborating. If Williams leaves NBC, might a door be open for him at Fox News or elsewhere? The guessing game about the anchor's future has become more active in recent weeks, partly because a new chairman, Andy Lack, took over NBC News at the beginning of the month. Lack has given no signal about what's going to happen. The guessing game is also active because NBC and other television networks are heading into the "upfront" season. That's when advertisers make big commitments to buy air time in the upcoming TV season. The Washington Post's Paul Farhi reported last week that "people on both sides of the negotiations, including some at NBC, say it is unlikely that Lack and NBC will go into the upfronts without resolving Williams's status beforehand." Farhi added that "given the crucial role anchors play in the success of a news broadcast, uncertainty over who will anchor 'Nightly News' would hurt NBC's negotiating position with advertisers." There's that word again -- uncertainty. Lack and the man who appointed him, NBCUniversal CEO Steve Burke, know that putting Williams back in the "Nightly News" chair could hurt things with Holt. Inside NBC, no small number of people are rooting for Holt, who is well-liked and has been in line for the top job for years. Conversely, keeping Holt in the chair could mean a multi-million-dollar settlement with Williams, who signed a lucrative five-year contract just months before the exaggeration scandal erupted. It is unclear whether any legal negotiations are currently taking place. Williams' attorney declined a request for comment, as did NBC. Last week he was photographed in New York City with his wife, daughter and a puppy -- and the image showed up on the cover of the New York Post the next day. Was it just dog walking, or was there something more to it? "Dogs are always an attempt at image rehab. You see a dog, you see a rehab," USA Today media columnist Michael Wolff said to me on CNN's "Reliable Sources" on Sunday. The ultimate question is about what NBC's internal fact-checking investigation of Williams has found. The investigation began within days of Williams' apology for exaggerating his involvement in a 2003 Iraq War mission. NBC has yet to comment on whether the investigation is complete. Every day the investigation continues is a bad day for Williams; to some people, it implies that the journalists have uncovered more damaging information. Vanity Fair reported earlier this month that the investigators "have compiled a number of other incidents that, taken as a whole, paint a portrait of Williams as a man who has consistently burnished his stories." For the network, the fact-checking findings may be a form of leverage -- to either say that Williams has been cleared of further embellishing, or that he's too damaged to return to the "Nightly News."